It was 40 years ago when parts of the ‘Report of the Office of the Secretary of Defense Vietnam Task Force’, or more widely known ‘Pentagon Papers’, were first leaked to and published by the press. First by the New York Times, on this very day, 13 June, in 1971, before a court order was won by the government to prevent further publication. Other newspapers followed the Times’ lead, but were soon also restrained. Then at the end of the month the United States Supreme Court ruled publication could resume. And today, 40 years on from the Times’ first publication of the leaked documents, the report is being released in full by the National Archives, along with the Kennedy, Johnson and Nixon Presidential libraries, filling 48 boxes with around 7,000 declassified pages. According to the National Archives about 34 per cent of the report is being made available for the first time, with no redactions and with all the supplemental back-documentation included. In an Associated Press report on the release, Daniel Ellsberg, the former private foreign policy analyst who leaked the papers, gives his thoughts on the significance of today’s release. 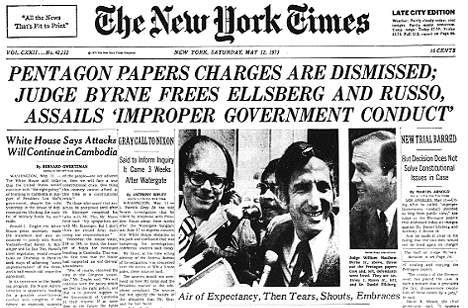 Most of it has come out in congressional forums and by other means, and Ellsberg plucked out the best when he painstakingly photocopied pages that he spirited from a safe night after night, and returned in the mornings. He told The Associated Press the value in Monday’s release was in having the entire study finally brought together and put online, giving today’s generations ready access to it. This entry was posted in Data, Editors' pick, Politics and tagged daniel ellsberg, leaks, New York Times, pentagon papers on June 13, 2011 by Rachel Bartlett.